Lens cleaning station, respirator wipes, lens cleaning wipes, lens care. These products can be used to clean eyewear and respirators. The Uvex Clear® portable, disposable cleaning station holds a 16 oz bottle of Uvex Clear cleaning spray and 1500 tissues for convenient and fast cleaning. Formulated for use on lenses with anti-fog and anti-scratch coatings. Eyewear cleaning wipes Silicone-free, anti-fog and anti-static wipes for glass or polycarbonate lenses. individually wrapped. Used on computer screens. 15% isopropyl alcohol concentration, 4% non-hazardous ingredients, 81% water. 5" x 8" wipe size. Sold by the box, 100/box. 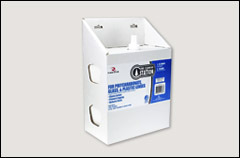 are easy to use 6" x 7 1/2" wipes used for respirators and other personal safety equipment clean-up. 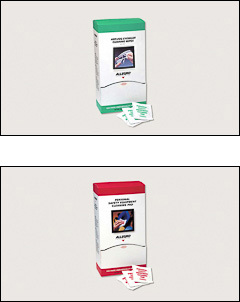 These benzalkonium chloride and alcohol wipes reduce the hazard of contamination. 220 wipes per canister..
Alcohol-free wipes. Individually wrapped to retain moisture. Will not damage face piece materials. Sold by the box, 100/box. Alcohol-free and individually wrapped. Sold by the box, 100/box, 5 boxes/case.